The story is about a family of six, the Fuchigami family, who one horrible night experience a fire which not only burns the house down, but also ends the life of the father while saving the life of the mother, who ends up in a coma. 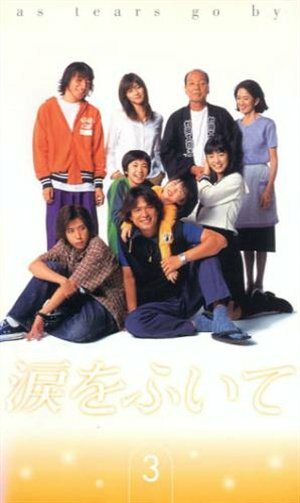 The four children; Kenta (Ninomiya Kazunari) the oldest and rebellious one, Kota (Tatsumi Yuudai) second youngest and serious one, Momo (Ueto Aya) second oldest and only girl and Ryota (Kamiki Ryunosuke) the youngest who still wets his bed, are now left without guardian, and no one steps up to take responsibility, except Onishi Katsuo (Eguchi Yosuke). Katsuo is their father’s kouhei, and in a spur of the moment says that he is going to take care of the children, because he believes that he owns their parents, and he doesn’t want to lose (it’s kind of difficult to explain, but if you watch it you’ll understand immediately). I liked it, a lot. I usually don’t like ‘old’ dramas, because it seems like, in Japan, the fashion is lagging, so a movie from 2000 seems like it’s from 1990, and I gotta admit the scripts are usually very slow and unnecessarily emotional, like beyond normal, from what we would call a trivial thing, they go further and see it as the end of the world. But to be honest, I didn’t mind it in this drama, mainly because the problems are very ‘this year’; like bullying, selling yourself and responsibility. Loved it. And I love that it wasn’t a teacher this time around, it was a useless adult, who learns from his own mistakes, but still teaches the kids what and how. Acting wise I was surprised to see three actors, whom I only know as adults; Ninomiya Kazunari (a J.E. that is known for his sarcastic tone) we see him here as an 17 year old caring big brother, Ueto Aya (one of my fave actresses) we see as an 14 year old girl trying to be all grown up, and Kamiki Ryunosuke (Kyu from Tantei Gakuen Q) we see as an 7 year old kid, who wets his bed. All in all, loving it. ☆☆☆½ / 3,5 out of 5 stars.